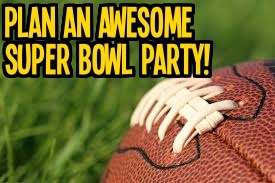 Plan a Super Bowl Party! Food, drinks, friends and, of course, FOOTBALL! When you think Super Bowl, you think snacks! Salty, sweet, savory, all of it! There are always options like chips, dips, pretzels, wings and all things cheese. For the sweet tooth, there are cookies, treats and cupcakes that can be customized to your favored team or shaped like footballs. To wash down the food, don’t forget the brews, some punch and plenty of sodas. With all the beer commercials you’re sure to see, be ready with some on hand. Whatever you decide, be sure to keep the recipes easy. You should be getting to see the game, too, not be cooped up in the kitchen the whole time. Since you’re guests will be spending most of their time watching the TV, planning entertainment isn’t much of an issue. If you have surround sound, be sure to turn it up! For those not as into the big game, turn the usual epic commercials into their own game. Check out Super Bowl Commercial Bingo or “Rate the Commercial”. Last, but not least, décor! Pennants and streamers and your team’s colors are great ideas. With an inexpensive and easy tablescape that looks like the football field and banners saying “Go Broncos” or “Go Seahawks,” you’re all set!